Now that I’ve traced my Grandmother Bessie Reed [Hill] Pearce (1887-1974) through her father Joseph Marshall Hill (1858-1939) and his father John Dixon Hill (1824-1915) to his father William Hill (1799-1875), we want to share with you at least two family wills belonging to the Hills and the Marshalls. They come to us courtesy of Alice Drescher, my grandmother’s niece and my second cousin. The good part, as with all probated wills, they should still be available to the public through the Register of Wills Office at the appropriate county courthouses. I haven’t taken the time to check these yet. In the name of God, Amen [or literally, “As God is my witness, truly”], I Joseph Marshall of Little Beaver Township, Lawrence County, Pennsylvania, do make, publish, and declare this my last will and testament [meaning “to testify” or “hold up for witness”], hereby revoking all former wills by me at anytime heretofore made. 1. Payment of all my just debts and funeral expenses . . . and to place a suitable grave stone at my grave. 2. Give and bequeathe unto my beloved wife Elizabeth [knick-named “Betsy”] absolutely all my household and kitchen furniture and my library, and one cow, her choice, and my __ buggy and harness and also the interest or income of all my personal property not hereby specifically bequeathed, during her life, the said personal estate to be kept invested by my executors during her life for this purpose. 4. The personal estate is to be kept invested during the life of my wife, but afterwards to be divided among my four daughters, share and share alike. 5. To my son Robert F. all my livestock and farming implements of every kind and description. 6. In case of the death of my son Robert F. Marshall happening before the time of the decease of my said wife . . .the farm, the provisions, and the legacies [go to] my wife during her natural life, and at her death I authorize, empower, and direct my executors here, according to their best discretions and on such [sell all] together with the personal estate invested to be then divided as follows: the same to be equally divided to and among all my children, the children of Robert [but he doesn’t mention Robert’s wife], or any other deceased child, representing their parent and taking a share, but before any division, the sum of seven hundred dollars to be given to my niece Alice Doran. 7. 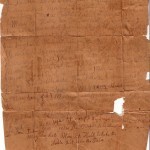 I nominate and appoint my son John C. Marshall and my son-in-law John D. Hill [my great-great grandfather and this seems unusual to name an in-law, except that John D. had been a Captain in the Civil War and was then a land owner and businessman] to be executors of my last will and testament. Although this would have been a lot of money in 1878, it may have fallen short of the amount Joseph promised his four daughters, his son John C., and his niece Alice Doran. Wife Elizabeth “Betsy” lived only five years beyond Joseph,until 1894, so that wasn’t a problem, and Robert died in 1931, but had the full possession of the farm. I still wonder what was to happen to Robert’s wife, should he die before his mother. Mary M. Hill to get looking glass [mirror], is upstairs, the smallest stand that is in the parlor. Florence and Maggie [another Margaret?] to get the other one. Bessie [the only one, my grandmother] and Mary S. Hill, the feather bed with pillows and bolster. [long, narrow cushion or pad – why would these beneficiaries want to share a bed? This Mary was probably my grandmother’s sister, Mary.] Florence and Maggie, pillows with bed quilt and a tablecloth apiece. Mary M. Hill [already mentioned above], two pillows with a bolster. It is understood that Bessie’s to get the washstand. With one of these a rocker. To Sadie M. [daughter-in-law, wife of Francis Leroy] the highest bedstead in the house. Harold H. [unreadable] and the stove Clarence Hill. Alice H. [daugher-in-law, my great-grandmother] and Ella Hill [son John W.’s wife] to divide the tableware and kitchen furniture. My navy shawl as they see fit. Yes, let Joseph the largest table if he wants it. One looking glass. Also the carpet to be divided up. Mary M. Hill to take the table that is in the parlor. Margaret S. Hill signed her formal name at the bottom of the old brown envelope. I wonder: the text is so confusing at times, back and forth, almost as if she is thinking out loud. 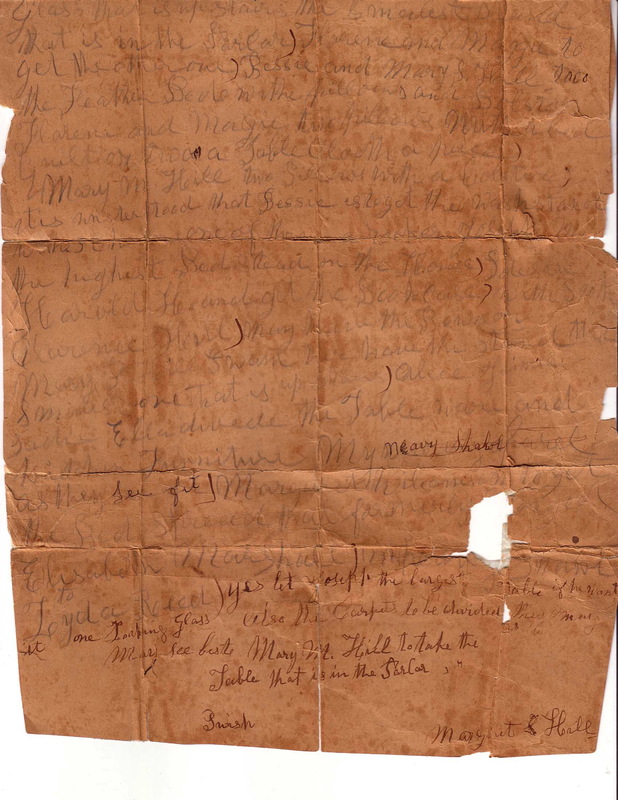 Could this simply have been a draft of ideas that she jotted down on the first paper she found, an old envelope, and mailed to her son John W. for transcribing? But why the formal signature? She doesn’t name an executor or other formal details or have witnesses, which are usually found in a legal document. 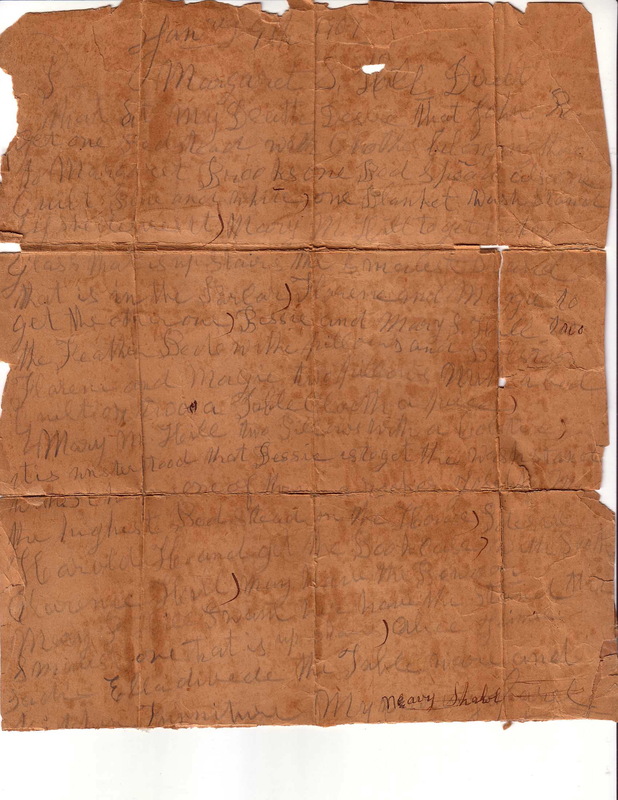 We don’t know when Margaret Sarah died, but could this simple list have been found after her death and mailed to her son? Her husband, whose formal will we’ll look at next, was seven years older than she was and may have been beyond probating such matters. The answer to that is “no,” because as we’ll find, he left his estate to his wife ten months after her list was dated. She must have been still living. 1. Pay all just debts and funeral expenses. 2. I give and bequeathe to my wife, Margaret S. Hill, all my household goods, books, pictures, and other effects not otherwise disposed of in this will contained in our home. I also give my wife the entire use and control of my dwelling house, during her life, or as much thereof as she may choose to occupy. I also direct that she be paid Fifty dollars per year by each of our three sons, Joseph M. Hill, Francis L. Hill, and John W. Hill, payable semi-annually during her life, and should any additional money be required to maintain her comfortably, they shall bear the additional cost. Share and share alike. 3. I give to my son W.W. Hill [by his first marriage] sixty acres of land off the west end of my farm in Adams Township . . . and at his death to be the property of his sons and daughters, said land to be chargeable with the maintenance of Jennie G. Hill, their mother, during her widowhood only. 4. I give to my son Joseph M. Hill [my great-grandfather] the farm upon which he now lives in Pine Township . . . chargeable with the Fifty dollars per year to his mother, Margaret S. Hill [and shall become the property of Joseph’s sons and daughters chargeable with the maintenance of my Great-Grandmother Alice Virginia Moon Hill]. 5. [Francis L. Hill receives the 35 acres farm on which he resides plus 20 acres off the east side of his father’s farm. His children are to care for their mother, Sadie B. Hill]. 6. I give and devise to my son, John W. Hill, during his life, all the balance of the farm upon which I live. . . I also give my son my iron safe in which to keep valuable papers [all to go to his sons and daughters chargeable with the maintenance of their mother, Ella B. Hill]. 7. I give to [each of] my grandchildren Leroy Love, Margaret Brooks (maiden name Love) [so her mother Margaret, born to John D.’s first wife, must have married a Love but is now probably deceased], and Bruce Love one hundred dollars, payable as they each attain the age of Thirty years. 8. The balance of my estate consisting of money in savings banks, bonds, and mortgages after all expenses are paid shall be distributed between my four sons, share and share alike, deducting from each one of them all money or other valuables heretofore furnished them as represented by book accounts or notes on my books extending back many years. Should any one of my sons be dissatisfied with this my honest effort to do justly between them and commence any suit at law, or give unnecessary trouble in any way to the Executor herein named, shall forfeit and be debarred from receiving any share in the distribution of the proceeds realized from the sources mentioned in the above eight sections of this instrument. 9. [John W. Hill is named Executor]. The legal witnesses were J. R. Stoup and George S. Dickson. Except for the iron safe given to son and executor John W. and the stern warning to all his beneficiaries not to question his judgment in distributing the estate, Captain John D.’s will is fairly simple. He isn’t concerned with individual items of property and generally charges his heirs with caring for his wife and each other after his is gone. 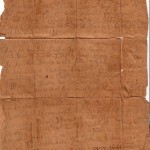 Unlike Joseph Marshall’s will and Margaret Sarah Hill’s list, John D.’s wishes are easily interpreted. Today, much of his original farmland is still in the family and is being farmed. However, the Mars area, consisting of Adams and Cranberry Townships, is the fastest growing suburb of Pittsburgh, so the future for “green” use of our family’s land isn’t very bright. Nor is it for any of the farms and homesteads of William and Sarah Hill or Joseph and Elizabeth “Betsy” Marshall’s descendants. But, in the coming months we hope to continue our research into the living history still available in Western Pennsylvania. In other words, we still have plenty of relatives to meet and talk to. Hi, it’s Janelle again.😊 Mary Anne Hill married Robert Love. Her Daughter was named Margaret Sarah Love. Margaret married Fred Brooks. Mary Ann must of really loved her step-mother and considered her to be her mother as her biological mother passed when Mary Ann was but a child. Margaret Sarah Love (Brooks) is Margaret Sarah Marshall’s (Hill) step-granddaughter if you will. Thanks again, Janelle. Your wonderful research is now here for all to share. Keep up the good work!